Entering week 6, and I feel great! My next appointment with my GI is in mid-July, and I have to admit, I’m a little nervous about coming off this diet. It has worked so well for me, and I’m worried about how I’ll feel when I start incorporating FODMAPs. I recently told a friend of mine that I feel like a different person since beginning this diet. I have so much more understanding of my body and my digestive system, even though I don’t really know what had been causing issues. I have understanding that something was, and now I know how I can feel better. I didn’t know that I didn’t have to feel sick, bloated, gassy, and awful after every meal, and this realization is life-changing. 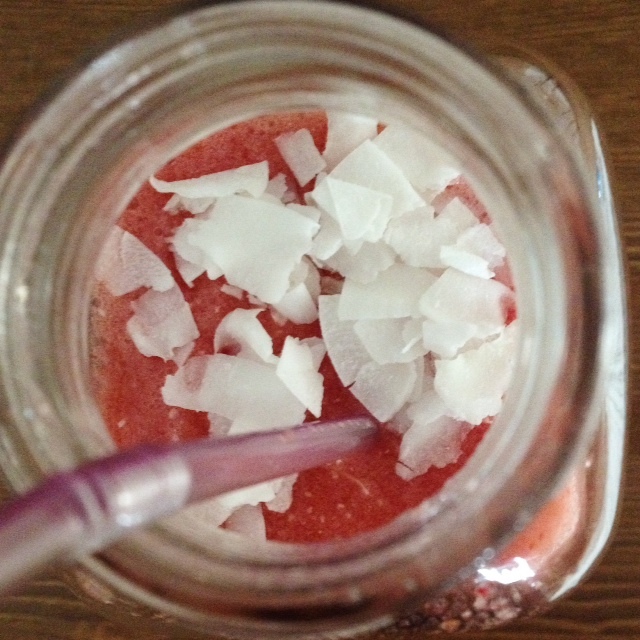 I made a really delicious strawberry smoothie for a snack, that tided me over for several hours before my next meal. Strawberries can be so filling! Alternate pouring in fresh orange juice and coconut water to the blender until the liquid amount reaches 8 oz. Add coconut flakes (or chips). The other highlight was a 5 ingredient BACON pasta dish! There are two things that have really gotten me through the low FODMAP diet: potatoes and meat. I like that I don’t have to cut out carbs, just gluten. I love that I don’t have to cut out meat. Whenever I can find a meat dish that I can make low FODMAP, I get really excited. The bacon pasta dish came from this recipe from Gimmie Some Oven. I omitted the real pasta and asparagus, and added GF pasta and green beans. The result was light and full-flavored, and a great pasta dish for summer. Meanwhile, add bacon to a medium saute pan. Cook over medium-high heat, stirring occasionally, until crispy. Remove the bacon with a slotted spoon and set aside. Add green beans to the pan and saute in the bacon grease for about 5-6 minutes, stirring occasionally, until cooked. Remove green beans with a slotted spoon, and set aside with the bacon. Slowly add the white wine to the pan, and scape the bottom of the pan with a spoon to deglaze the pan. Continue cooking for 5 minutes, or until the wine has reduced by about half. When the pasta is cooked, drain it. 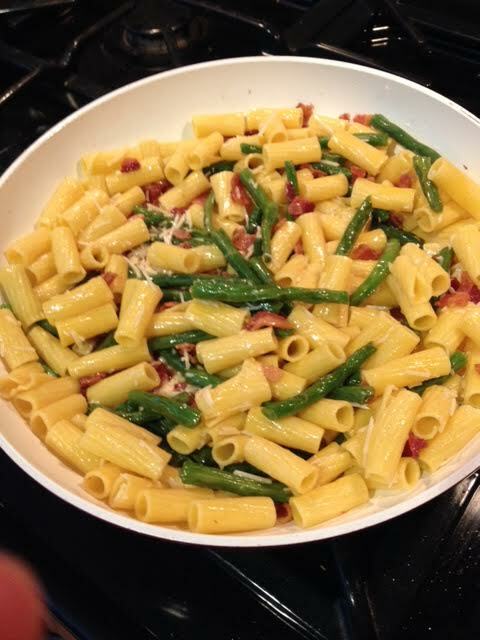 Then add the pasta, green beans, bacon and 1/4 cup Parmesan cheese to the saute pan, and toss until combined. Sprinkle pasta with the remaining Parmesan cheese and serve immediately. I read all the time that green tea is supposed to be so good for us. Fights free radicals! Speeds up metabolism! Slows down the aging process! Fights cancer! I am not a tea drinker, with the exception of Trader Joe’s Candy Cane green tea. I like it because it doesn’t taste like tea, it tastes like a melted candy cane. But I found a recipe in Women’s Health for a green tea cooler that sounded good. 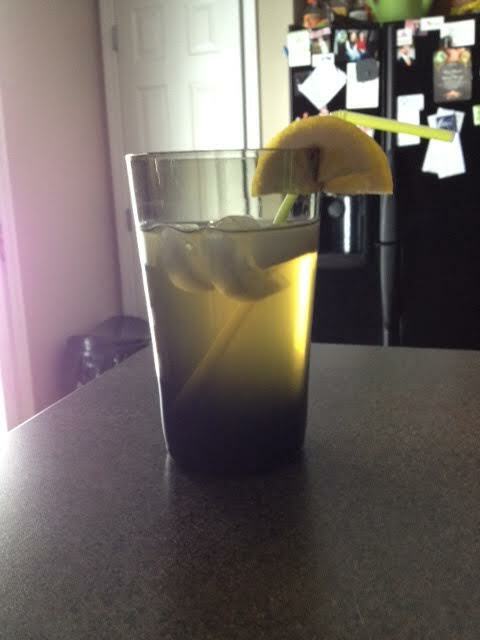 It contained mint, ginger, and lemon, three things I love! It was really hot this weekend, so I decided to give it a try. The tea was OK, and had a very strong lemon taste (I probably put in too much lemon juice). It was refreshing. However, it wreaked havoc on my digestive system. This may be due to the fact that I hardly drink green tea, or the amount that I had, but it’s not an experience I wish to repeat. I’ll stick with iced lemon water for a refresher! My birthday is at the end of this week, and I decided when I first got on this diet that I would cheat and eat cake. I’ll be curious to see how my body responds. But, happy birthday to me! My gift to myself is to allow cake into my body for one day, since real cake is one of my favorite foods.